Description of the 1875 commencement. The class of 1872 holds a reunion, which is discussed in depth. Alumni hold a reunion in Baltimore. The Class Day officers are elected; G. E. Morgan is president. Class of 1871 plans a 15-year reunion. The Alumni Association holds a meeting in Philadelphia. Belles Lettres challenges Union Philosophical Society to a public debate. Alumni plan a Grand Centennial Reunion in Philadelphia. 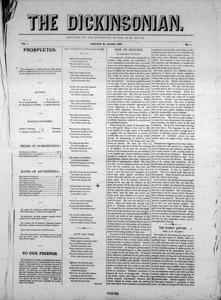 The first issue of The Dickinsonian after a major format change. Quick clips of news about other schools abound. An editorial on fraternities and a story on preparatory schools also appears. Sigma Chi Fraternity holds their 11th biennial conference in Philadelphia. The Union Philosophical Society library reaches 10,000 volumes. A history of Chief Justice Roger Taney’s time at Dickinson, written by him, is published. Students debate the national politics of the era. Natural science education in schools is discussed. Students bemoan coming examinations. The Union Philosophical Society celebrates its 88th anniversary in Emory Chapel. The Belles Lettres celebrates its 91st anniversary, also in Emory Chapel. The new chapel portion of West College is completed and finished. Seniors are slow to leave Carlisle after Commencement. The upper class beats the lower class in a football game, 14 to 1. The College Glee Club organizes.